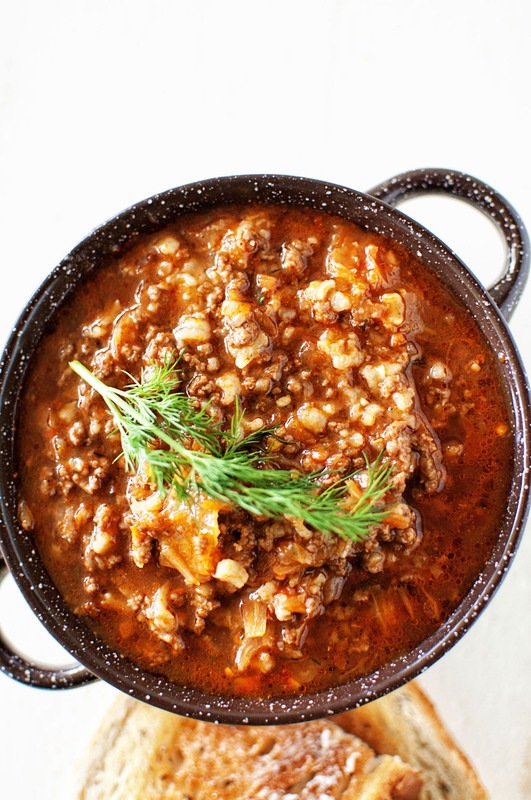 Cabbage Roll Soup: The easy way to have the flavor of cabbage rolls without the rolling. 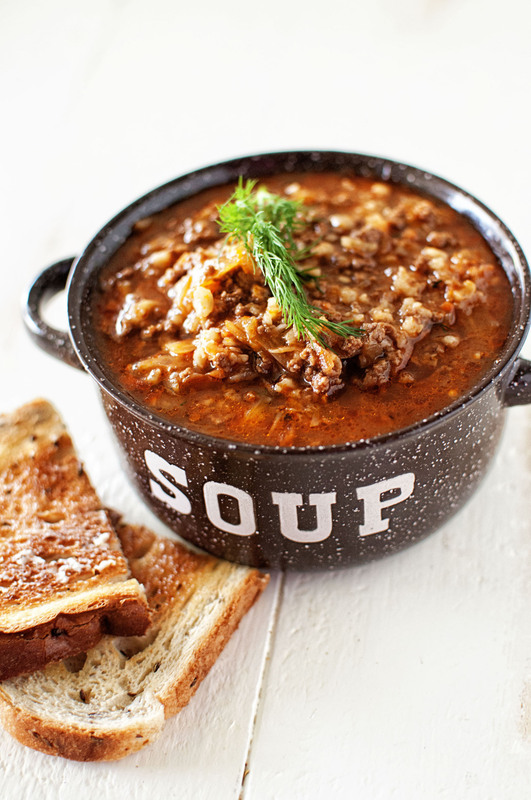 Beef, rice, cabbage, veggies, beef broth, V-8 juice, and fresh dill make for this hearty soup. I get asked a few times a day how I’m doing? How am I handling all this? Truth be told, just fine. I don’t dwell in the what if’s. And I don’t dwell on the fact that I watched my husband code in front of me. Because he’s alive. And he’s well. Really well. He was cleared again for all things by his primary care physician today so that is two cardiologist and a primary doctor saying go forth and live your life. The biggest change is that above all they want my husband doing daily cardio. While he played hockey, he has always been more of a lift weights with a quick cardio warm up kind of guy. We are working on weeding out the stress in our lives and learning to say no even if we feel guilty about doing it. He’s eating a more heart healthy diet. I’m doing it with him because well, it’s doesn’t hurt to be nice to my heart, and I know he will be far more successful if I play along. No doctor has him restricting calories or anything like that and no one asked him to lose weight. We all know I don’t restrict the calories…I eat when hungry. I assume he probably will lose weight just in the 7 days a week of cardio. I suspect I will too. Just because I will now have bonus cardio everyday when I go to the gym with him after work and on the weekends. And no doctor says he has to be super strict on his heart healthy diet either…I’d say most days we are 90/10. We are getting in all our fruits and veggies and whole grains…with a side of Peanut Butter Snickers for me. 🙂 I do track our food just to see how much saturated fat, cholesterol, and sodium we are eating. This soup was made pre-heart attack the way it’s written. I have made it since post-heart attack and simply changed the ground chuck for beefalo…it’s a thing…you should try and find it. And we switched out the beef broth for low sodium beef broth and the V-8 for low sodium V-8. Thanks again to all of you who have left comments or emailed me. I appreciate the support. 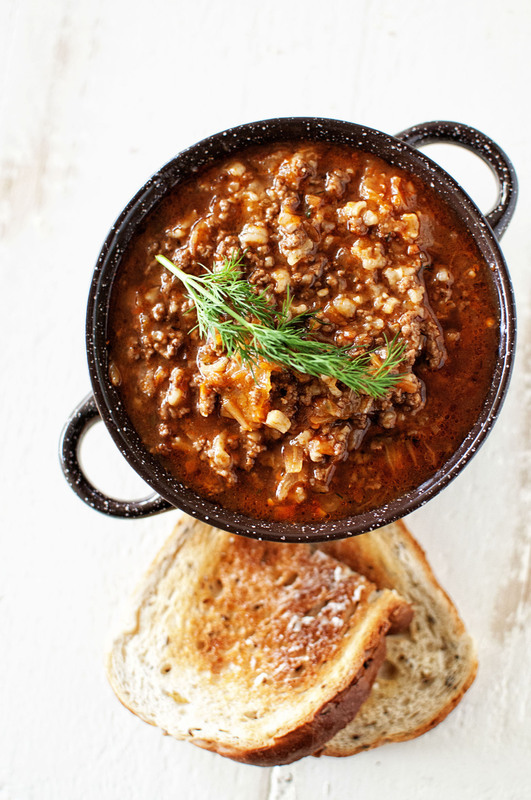 Using a large stock pot add olive oil and cook the ground chuck over medium-high heat, breaking up with a potato masher or meat masher. Drain the fat from the ground chuck, leaving 1 TBSP of drippings. Add cabbage, onions, celery, carrots, and garlic and cook until vegetables begin to soften, about 10 minutes. Add the broth, V-8 juice, rice, Worcestershire, thyme, and bay leaf and bring to a boil. Reduce heat medium-low and simmer soup until the cabbage and rice are tender, about 30 minutes. Remove pot from heat and add dill, parsley, and lemon juice. Discard the bay leaf and season soup with salt and pepper. If you like things spicy feel free to add 1/2 tsp. red pepper flakes. I don’t do spicy and my husband does so he adds it after he gets his bowl of soup.